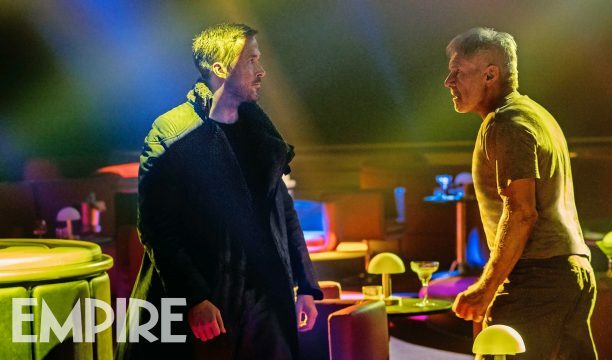 Tensions flare between LAPD rookie K (Ryan Gosling) and Rick Deckard (Harrison Ford) in today’s all-new pic for Blade Runner 2049, Denis Villeneuve’s long-in-development sequel that’s due to light up theaters in October. And we do mean long in development. Before Villeneuve officially signed on – thereby teeing up a welcome springboard ahead of his journey over to Legendary’s live-action Dune movie – a sequel to Ridley Scott’s cult sci-fi classic had been kicking around in some shape or form form for almost 20 years. In 1999, for instance, Stuart Hazeldine pitched an idea for Blade Runner Down, a follow-up that mined inspiration from The Edge of Human novel. While ambitious, that project was ultimately shelved, which became something of a recurring theme as the time worn on. But soon after Ridley Scott passed the torch on to Denis Villeneuve – for the record, the former director still holds an executive producer role on 2049 – 20th Century Fox’s gestating sequel finally began to take shape, and started welcoming some truly top-tier talent on board including Robin Wright (House of Cards), Ana de Armas, Dave Bautista (Guardians of the Galaxy), Mackenzie Crook and Jared Leto (Suicide Squad), who will play the part of Neander Wallace, a deeply mysterious Replicant creator who tends to muse about the rise and fall of civilizations. However, thanks to Empire, today is all about that aforementioned duo: K and Rick Deckard. And by the looks of things, the latter is none too pleased to see Ryan Gosling’s LAPD detective. You can check out the new pic up above. It’s the sequel 30 years in the making, but can Blade Runner 2049 possibly deliver on those pent-up expectations? It was never in doubt that Denis Villeneuve’s sci-fi opus would deliver on the visual front – you can tip your hat toward the director’s regular DP, Roger Deakins, for 2049‘s haunting aesthetic – but we’re more concerned with the film’s actual story. Firm details are under wraps for now, but we’ll be bringing you all the latest as more information begins to surface.